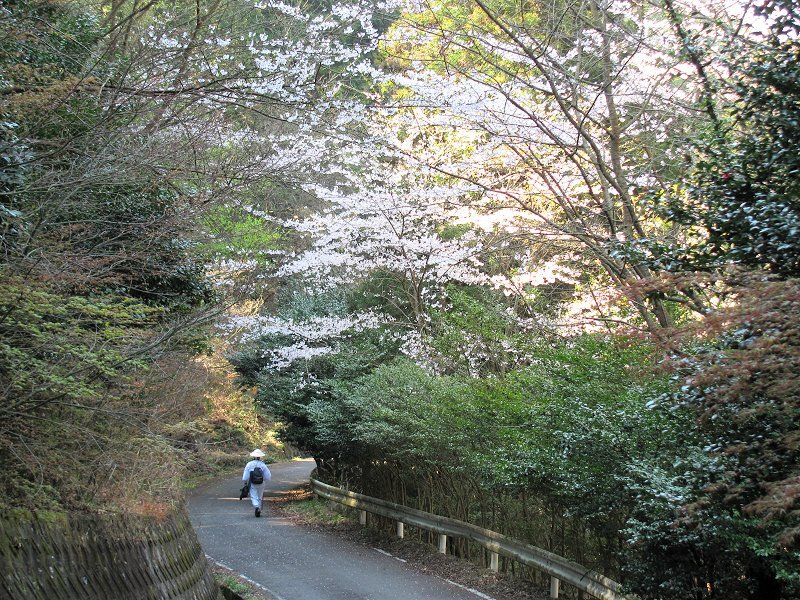 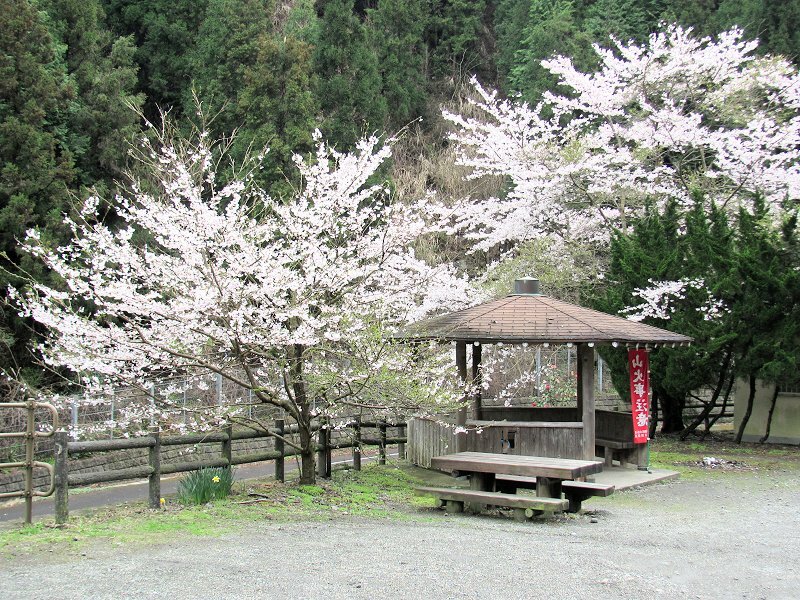 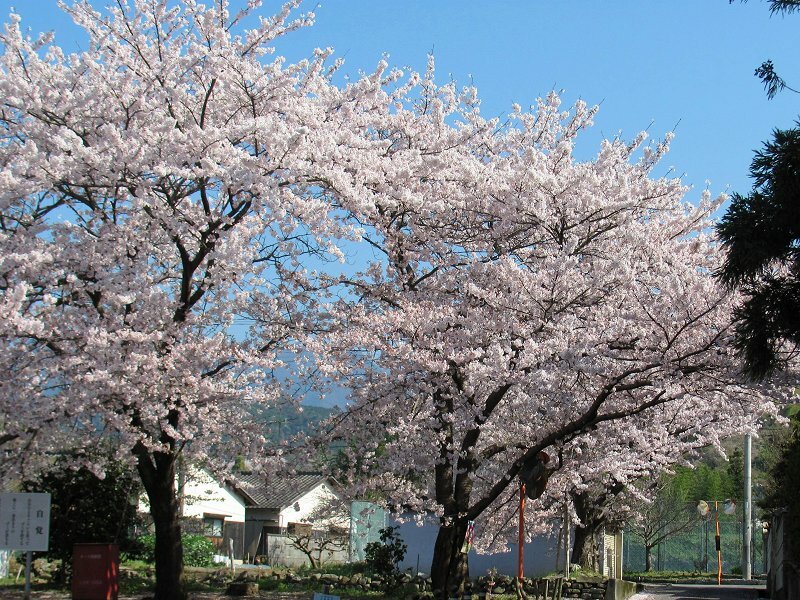 Cherry trees embrace the henro shelter at the start of the path up to the mountain temple of Yokomine-ji (Temple 60). 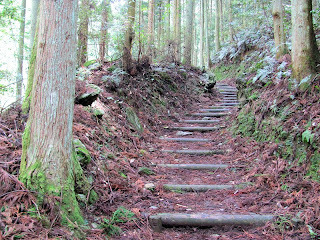 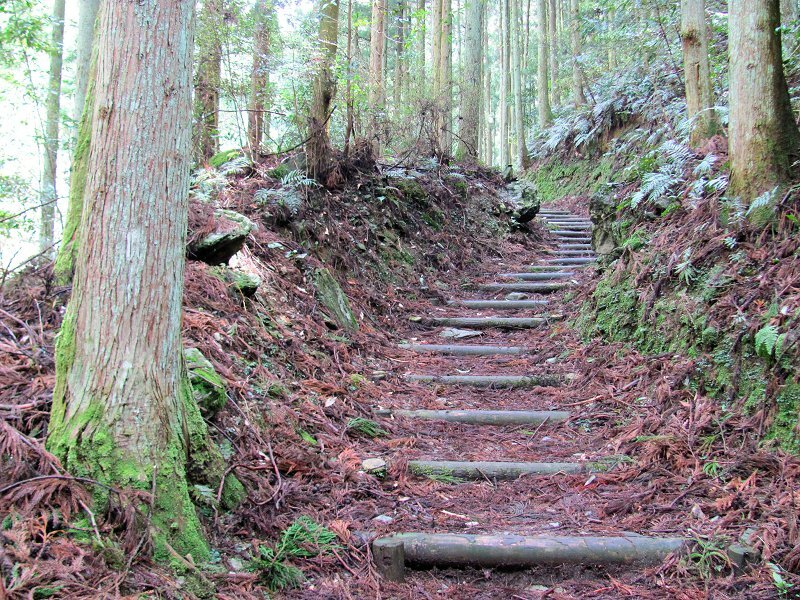 The beautiful path to Yokomine-ji ascends through a cool Japanese cedar (Cryptomeria) forest. 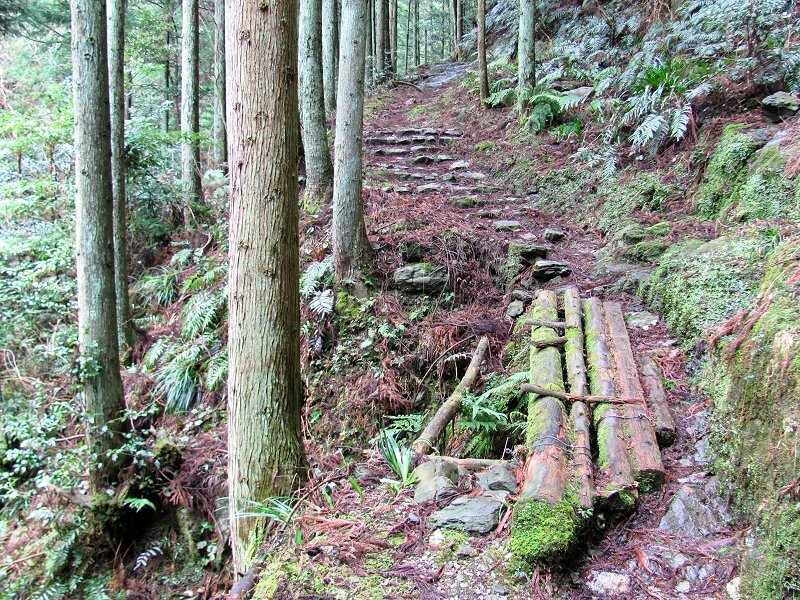 It's a steady climb, but a lovely mountain stream keeps you company in the lower reaches of the trail. 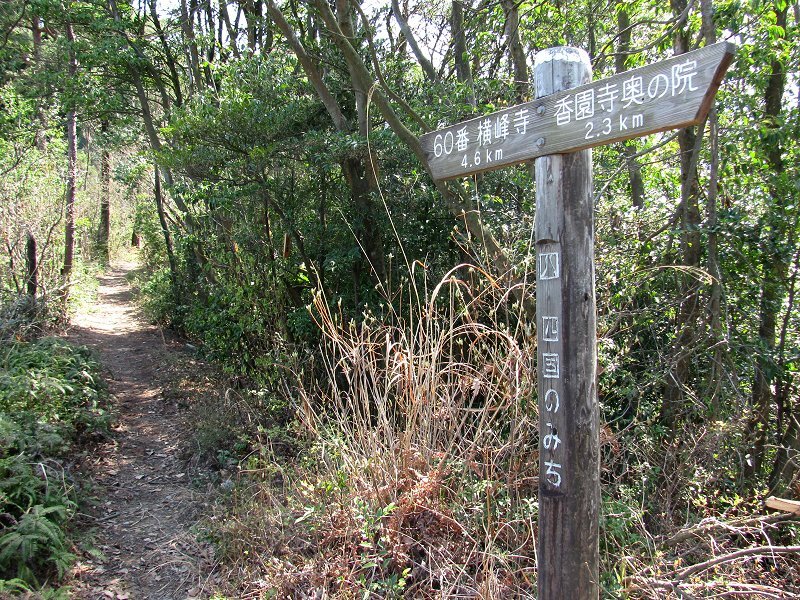 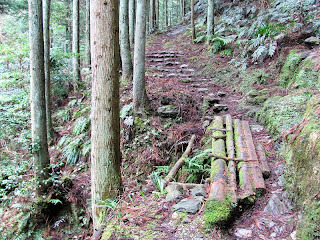 The pilgrim's path to Yokomine-ji. 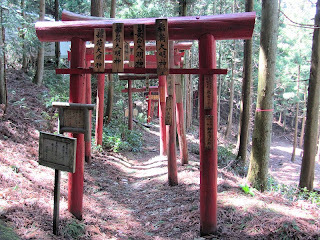 A line of red torii outside the Yokomine-ji temple compound marking a Shinto shrine. 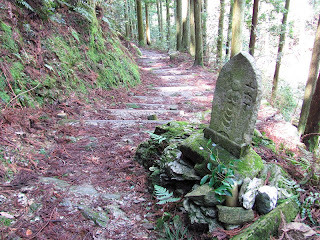 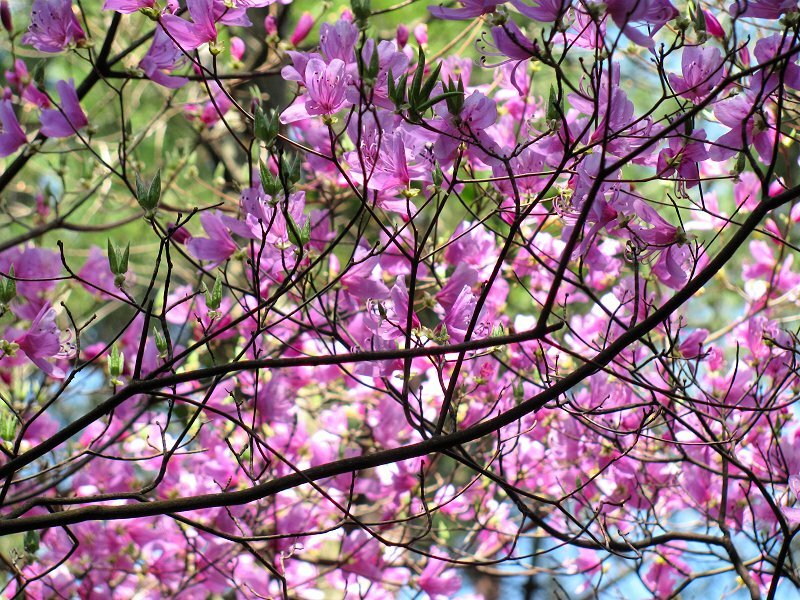 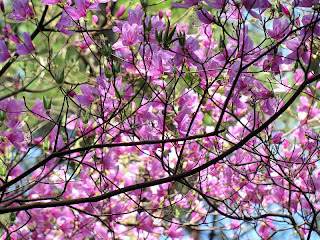 I passed under a "cloud" of purple azaleas on the descent from Yokomine-ji to Kouon-ji (Temple 61). 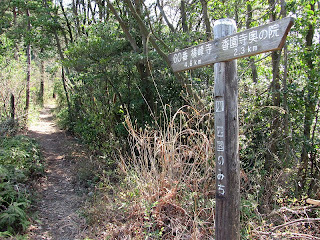 Path marker on the trail between Yokomine-ji and Kouon-ji. 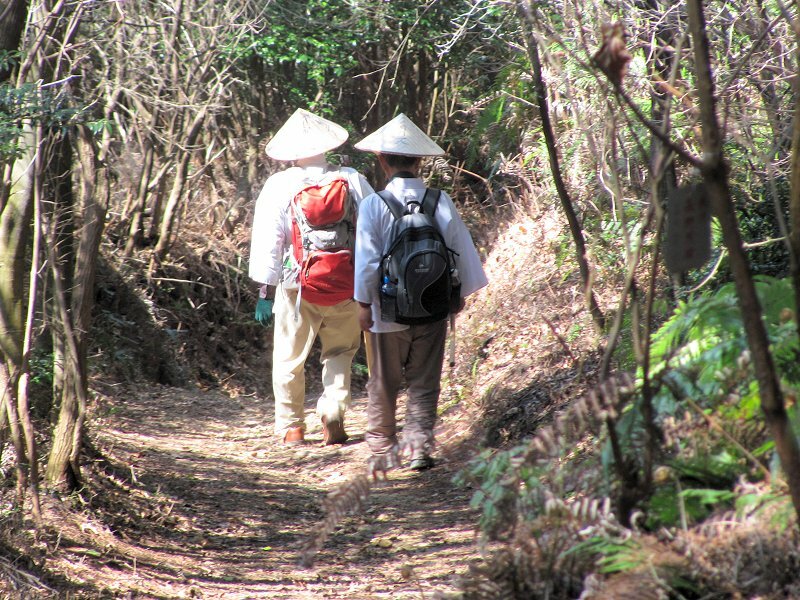 Two fellow henro in the trail between Yokomine-ji and Kouon-ji. 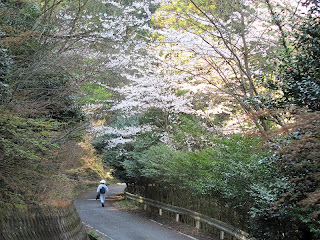 A henro passes beneath blossoming cherry trees on the way to Kouon-ji. 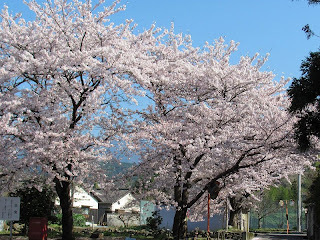 An abundance of flowering cherry trees in the parking lot at Kouon-ji (Temple 61). 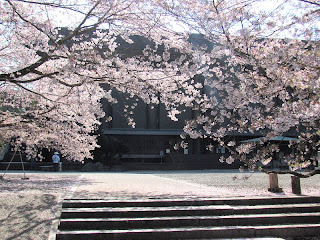 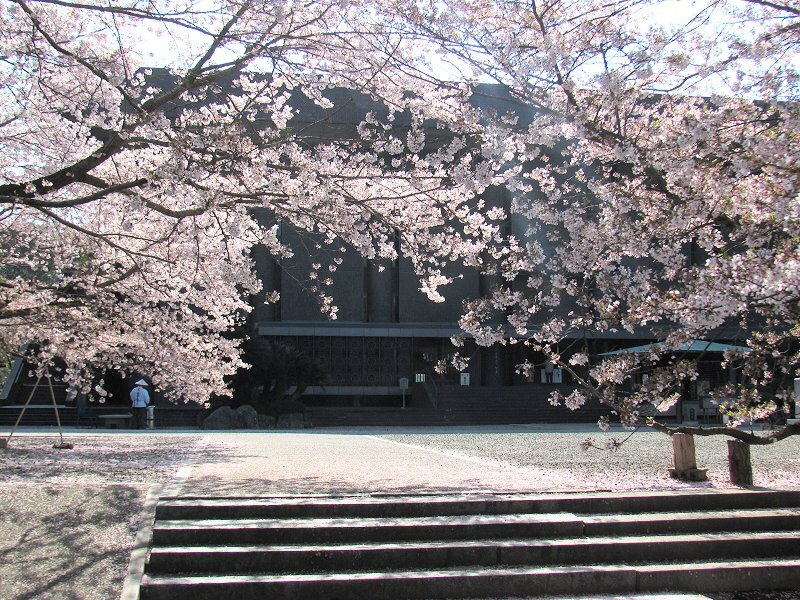 Cherry blossoms soften the severe, drab, industrial looking facade of the main hall (hondo) at Kouon-ji. 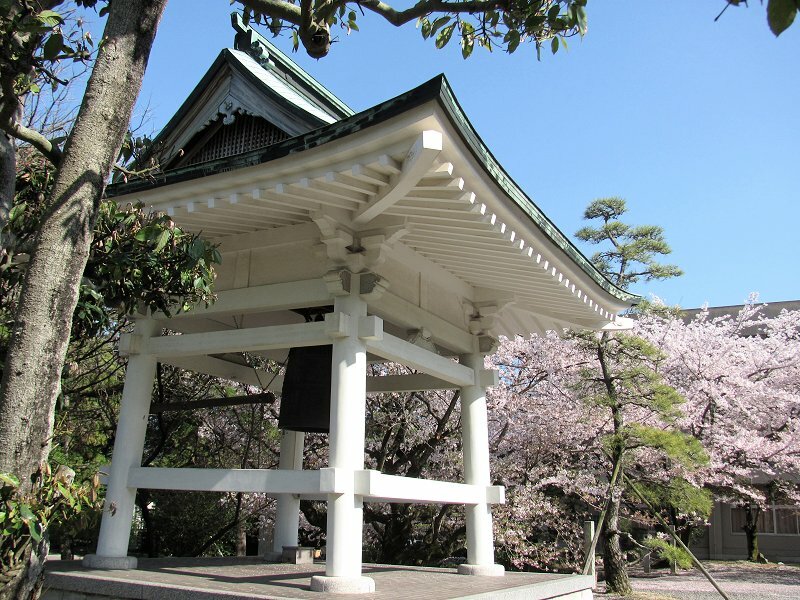 Kouon-ji's bell tower and cherry blossoms! 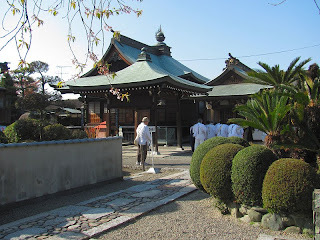 From Kouon-ji, I walked to the Iyo-Saijo train station where I caught a train back to Saijo City. 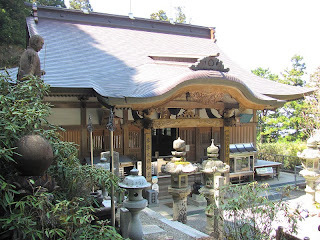 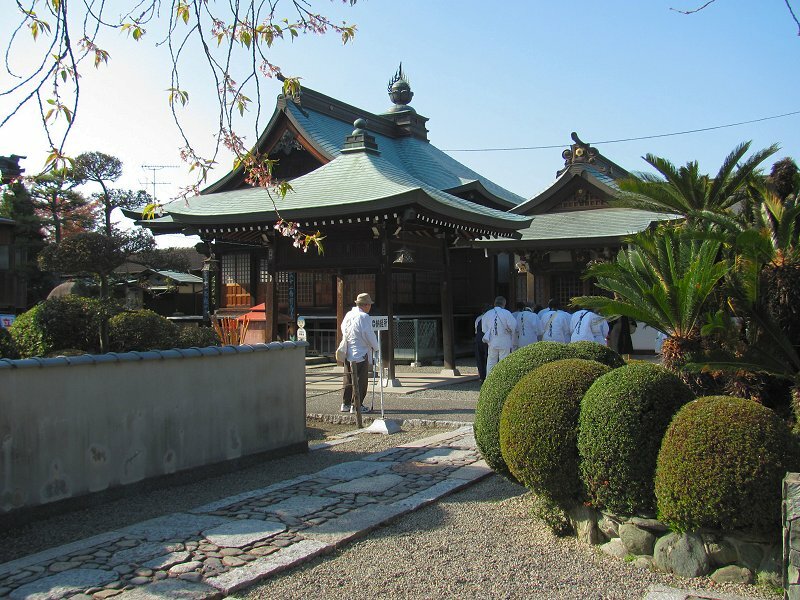 Next to the train station is Temple 62 (Houju-ji) which was playing host to a group of henro chanting a sutra.